Remember that salt cod I made the other week? Here’s what became of it. 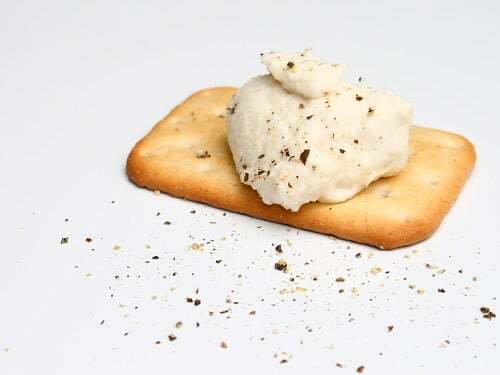 Brandade de morue or brandade de bacaloa, depending on if you’re French or Spanish is a simple emulsion of salt cod and olive oil, most often eaten with bread. It’s common across France and Spain, and versions of it exist in most other southern European countries. Since you went to so much trouble to salt the fish, it seems a shame to try and get rid of all the salt now, but get rid of it you must. Soak about 400g of salt cod in the fridge in a few changes of water for at least twenty-four hours, probably longer, until the fish is reconstituted properly and most of the salt has gone. Put the cod into a pan and just cover with water, adding a bay leaf, a couple of sprigs of parsley, a few peppercorns and a tablespoon of lemon juice. Bring the water to a boil, then reduce the heat to a gentle simmer for fifteen minutes. When the fish is cooked, break it into rough flakes and discard any skin and bones. The fish should break apart easily. If it doesn’t, cook it for longer. Put the fish into the bowl of a food processor and process it with two finely chopped cloves of garlic, a quarter of a cup of milk and two slices of white bread, the crusts removed. When the mixture is well combined, slowly drizzle in a quarter of a cup of olive oil, whilst the blades are turning, until the brandade is silky and smooth. Season with black pepper and maybe some salt (be very careful with the salt) and serve with bread and salad. I have never had salt cod. I have always been interested in trying it. It looks like quite a process! This looks delicious! I can't even imagine what it tastes like! Lovely photo! I had Salt Cod Brandade a few months ago for the first time and thought I would not like it – to my surprise – it was delicious! I bet my father would love this. I've never heard of it, but I'm sure he's had it growing up. Thanks for passing along the recipe. Lovely recipe… I think brandade is brilliant. Brandade is best served with toast and a tapenade of black olives with anchovy filets on the toast on which the tapenade has been spread. of electromagnetic radiation that the human eye can see.